Facebook, Inc. FB – FB was cruising in the premarket yesterday in the wake of an earnings beat, and we signaled a range of contracts where we supposed the heaviest action would fall (FB Weekly $106-111 Calls). It would not have mattered which set of contracts traders chose to strike, because they all provided chances at hefty gains. Expedia, Inc. EXPE -The buzz over EXPE’s buyout of HomeAway, Inc. AWAY was enough to get it moving in yesterday’s premarket. Our corresponding options idea for this one was to track EXPE Weekly $138-142 Calls and like FB, there was no losing pick within our specified range of contracts. Cheers to anyone that got in on the fun, as double-bag gains were possible across the board! Our regular readers will certainly recall our successful coverage of WTW as Oprah’s involvement was announced a few weeks back; we had monstrous success with our options selections, and even saw an amazing move from the stock itself. Our observed low on WTW was 10.76, and this morning we’ve seen it change hands for as much as 20.80. With this impressive early morning gap-up, we’re going to want to jump back into the mix with another options idea. We’ll be monitoring the Weekly $18-20 Calls for potential daytrade opportunities on the dip-and-rip which is likely to occur. On the stock side of things, we included ENIP in our premarket extended watchlist yesterday and this super-subpenny play didn’t disappoint, offering up the chance at single-session double-bag profits! From an early low of .0004, the stock surged toward the end of the session, reaching as high as .0009. That registered as an 125% intraday swing, and it came on more than three times the monthly average volume. We had a good run of success with equities early on this week, so we thought it was high time to split our focus and turn our attention back to some options trading ideas. We’ve had monstrous success identifying winning calls in recent weeks, and there’s a couple of events driving the following stocks to gap up this morning. As usual, we’ll be on the lookout for dip-and-rip formations to unfold in these scenarios. Facebook, Inc. FB – FB is soaring on the heels of a tidy earnings beat yesterday, and as a result, we’ll be scanning the FB Weekly $106-111 Calls for some exciting action today. If the premarket volatility is any indicator, we can expect to see some vigorous intraday swings from those contracts. Expedia, Inc. EXPE – Following a confirmed buyout of HomeAway, Inc.AWAY, EXPE is popping in early trading as well. For this one, we’ll be tracking the EXPE Weekly $138-142 Calls. 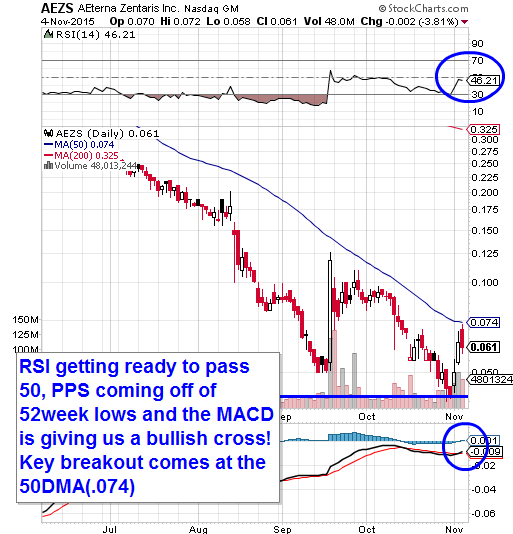 We’re going to be turning back to a stock that we’ve talked about in the past in AEZS. The stock registered a brand new 52-low of .04 a week ago today, and has been making solid progress in establishing higher lows off of that bottom since then. We’re going to begin watching AEZS more closely in the sessions ahead. We’re looking specifically for a break of the current 50DMA at .074, after which there isn’t much in the way of resistance until the .10-area. 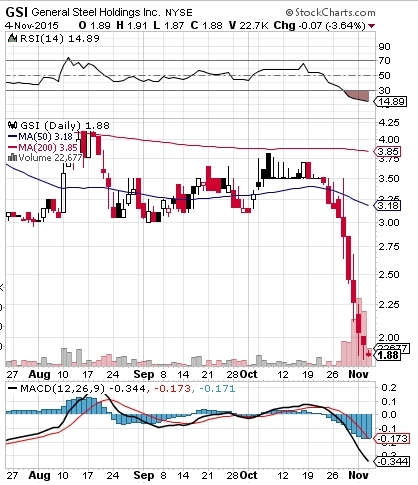 GSI has been backsliding for quite some time and has breached well into oversold territory. When we come across a chart like this, our natural instinct is to place it on bottom-watch. We had critical success calling out the bottoms on MIL and APDN toward the end of last week, and GSI is looking like it could be the next bounce-play.